We call this English Dogwood, and to be honest, I have never thought about looking it up to see if that's the right name or not. My wife brought home a sprig of it that a patient gave her and it has thrived. Anything that's pretty and thrives here is my kind of plant. I assume it's not native, but even though it spreads gently, it's not invasive and we only plant it around the house where exotics are allowed. You can jerk a piece out of the ground, put it where you want it, and it will reward you with rapid growth and clouds of white flowers. Uh, isn't that exactly what you said the last time you commented? Beautiful! I decided to google the definition to find out if it will grow in my part of Florida. Anything that is easy care is a bonus with me! I'm going to try to find one locally. I've been looking for a plant to replace a large hibiscus that is dying, and I think this will do the trick. It's not even 8:30 am and you two have educated me! This day is already a success. Good thing, 'cause it promises to be a doozy. Pretty! I've taken some photos of "the tree" in bloom,and a close up of the flowers. I'm just waiting until the leaves are full and I'll take a couple of shots of them. Then I'll post to see if anyone can help me figure out what kind of a tree it is! here is some shrub that grows wild in northern ca that folks call mock orange. it's been a while but i think the flowers look kinda like yours. it has a wonderful citrus smell. unexpected in the forest. bee-utiful. Makes me want to run out and see if the wild dogwoods are blooming here yet. Well, it can't be BOTH Dogwood and Mock Orange. Sniff the blossom. If it doesn't smell citrusy, it's dogwood. I bet. Post it and someone will know...probably Wayne. You know, I have not noticed a strong scent from these...I'm going home and sniff. Hop on your bike and go...take your camera and your raincoat. English Dogwood or Mock Orange...whatever it's called it beautiful. 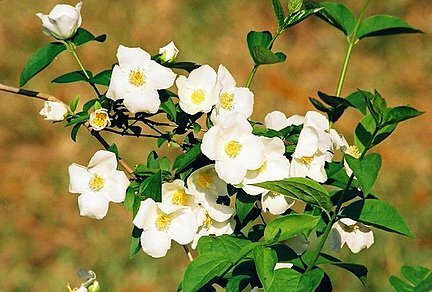 It doesn't quite resemble one of our dogwoods except for the white bloom, in that ours have 4 pedals too and are white. I've got real dogwoods in my forest, these seem to like the sun more than real dogwoods do. Oh wow! 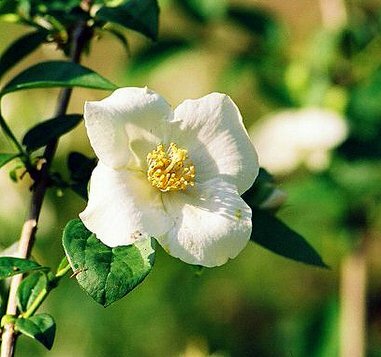 English dogwood and Mock Orange are the same thing? I had no idea! I've been drawn by another non-native dogwood (and as FC does, the non-natives are planted, and cherished, closer to the house - Dianthus pinks are my favorites). This one is known as either Cornus capitata or Dendrobenthamia capitata and is sometimes called Strawberry Dogwood. The fruits are fantastic. That's a heck of a genus name. Hop on my bike...Ha! I'm still trying to get up the hill in front of my house without passing out or walking the bike...everyday a little further. I did hop in my car yesterday with my camera...no sign of blooms yet. More rain today. ...my catfish made me say that. My wife's grandmother had this type of dogwood growing in Petal, Mississippi. When she passed away, my wife's mother dug it up and transplanted it in Seguin, Texas. After a few years, she dug it up again and transplanted it in Ozark, Missouri. We have recently transplanted it again, this time to northern Arkansas. I can see it out the window as I type this, and it is thriving. So they are apparently quite a hearty plant, as well as being beautiful. What's neat about that is the family connection. I have a guava tree that we refer to as "Aunt Florence's guava" because it came from her yard. She's gone, but the tree triggers the memory.